The magic and wonder of Disney has been a long standing part of my life. Growing up near the Magic Kingdom, visits to Disney World were celebratory. From birthdays to relatives visiting, a day at Disney was a special event. Looking back, I recall small treasures that bring a warm glow to my memories. From my mom loving the Pirates of the Caribbean (because it was always cool inside the ride) to my dad vigorously spinning the tea cups to make me squeal, the fun, free moments still resonate. As a mom, I want my kids to have these magical moments. While the grand moments are spectacular. (I still have a sense of awe about my fifth birthday in Cinderella's castle), the smaller, unplanned memories are my favorites. With my kids, I notice that they, too, see the little happenings as their favorite. Previously our family has been on the Disney Dream Christening Cruise and visited the Magic Kingdom and Epcot. While it has been a couple of years, I asked my kids what are their favorite memories of that trip. My youngest son said that he like being on television (we were interviewed by ABC) and he like watching the fireworks at night. For my older son, he liked finding the hidden Mickeys in the park and collecting his pins (food was a close third). When I asked them what they would like to do on a return visit, they just wanted to spend time having fun as a family. It wasn't about the fastest ride or the coolest characters to them. It was about experiencing the moments with all of us together. For our family, the Disney Side isn't about a thing, it is about a feeling. Creating memories as a family that will last long after the picture fades. 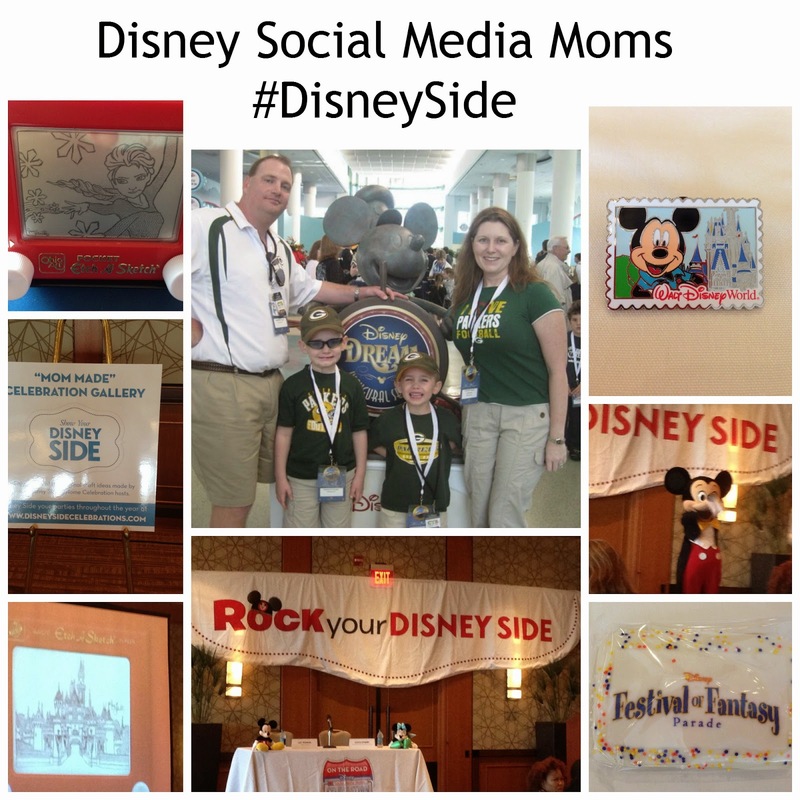 This summer I was given the opportunity to attend a Disney on the Road Disney Side/Disney Social Media Moms event. The large, varied group had all types of women who were ready to showcase their favorite Disney inspired moments and memories. For me, the biggest takeaway was not the impressive, magical place of Disney, rather Disney brings all types of people together. My memories and your memories aren't identical but they have a common thread. For a day or a week spent at the happiest place on earth allows people to dream big. In the confines of those parks, anything and everything is possible. So next time an opportunity presents itself, dream big. You might just show everyone your Disney Side.